Is it really possible that a toothpaste containing a natural chocolate extract can out perform any fluoride toothpaste? THEODENT says yes! 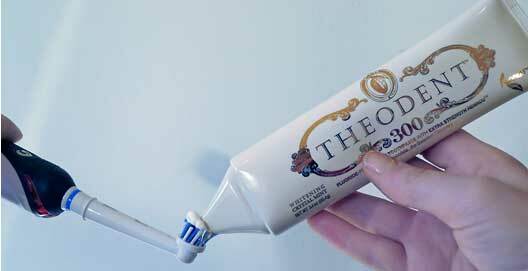 Theodent is a revolutionary toothpaste that uses an extract of chocolate instead of fluoride to strengthen teeth enamel and protect against decay and tooth sensitivity. The Rennou™ technology behind the Theodent toothpaste is the result of a research collaboration between Arman Sadeghpourin Ph.D. and Dr. Tetsuo Nakamoto DDS, Ph.D. The origin of the idea to use a cocoa extract as part of a formulation to protect teeth came about by pure accident during research on the effects of caffeine on developing teeth. It was the chance discovery that a molecule found in cocoa had positive effects on teeth enamel that led to the eventual launch of Theodent toothpaste in January 2012. Theodent is marketed by Theodent LLC is a New Orleans based biotechnology company that was founded by Arman Sadeghpourin Ph.D. Dr. Tetsuo Nakamoto DDS, Ph.D.
All of Theodent’s toothpaste products are based on their patented Rennou™ ingredient. Rennou™ contains the chemical compound theobromine which is a natural plant alkaloid derived from the cocoa bean. Most of us will have tasted theobromine in the form of chocolate, in fact, it is thought that theobromine is largely responsible for the pleasurable, warm feeling we get when we eat chocolate. In order to appreciate how Theodent works, it is important to know a little bit about the structure of the teeth and understand how tooth decay and tooth sensitivity develop. Teeth enamel is highly mineralized hard tissue that is comprised of 96% minerals and 4% water and protein. The main component of enamel is hydroxyapatite which is basically a crystalline calcium phosphate shell that protects the dentin layer underneath. A healthy tooth will have a strong layer of enamel protecting the more delicate and sensitive dentin and pulp layers underneath. Although enamel is the hardest part of the body, this does not mean that teeth are indestructible and everlasting! In fact, the outer enamel of a tooth is a very delicate matrix of minerals that can be quickly dissolved and damaged. The enamel on the outside of our teeth is constantly changing in hardness and strength throughout the day in what is known as the demineralization and remineralization process. Poor oral hygiene – The bacteria that are present in plaque feeds off of the carbohydrates and sugars that we eat and then excretes organic acid onto the teeth surface. The acid then begins to strip away the minerals from the enamel and weaken the teeth. If the plaque biofilm is not removed properly by toothbrushing and flossing, the healing properties of saliva may not be sufficient to remineralize and repair the teeth and decay will begin. To keep the teeth free of plaque it is recommended to brush the teeth twice a day and floss at least once a day. Poor diet – Certain foods can contribute and increase the demineralization process. Any foods that are high in refined sugar and carbohydrates will react with bacteria to form the organic acid that dissolves away the minerals from the enamel surface. Eating these kinds of foods multiple times a day can cause tthe oral cavity to become almost permanently acidic to the point where the teeth aren’t remineralized fast enough to prevent tooth decay. After eating a sugary snack or beverage, it takes about 30 minutes for saliva to return the mouth to a healthy environment for teeth. However, if more snacks like sweets or soft drinks are consumed in the meantime, the mouth can’t return to a neutral state where minerals can be replaced into the tooth enamel. Dry mouth – It is impossible for the oral cavity to remain healthy and balanced when the mouth is dry of saliva. Low saliva production can cause rapid tooth decay, mouth infections, and bad breath. Without an ample supply of saliva, it is likely that the teeth will demineralize quickly especially if combined with a diet of sugary snacks and drinks. A dry mouth can be caused by the following – diseases of the salivary glands, a side effect of many medicines, stress, diabetes, hormonal changes, anorexia and mouth breathing. Acid Reflux – People who suffer from acid reflux have a higher risk of experiencing relentless enamel demineralization and tooth decay. Acid reflux occurs when gastric acid travels up the esophagus ending in the mouth. So How Does Theodent Actually Work? Teeth enamel protects the more delicate dentin and pulp layers. Teeth enamel is made up of 96% calcium phosphate hydroxyapatite. Teeth are in a constant flux between demineralization and remineralization. When the mouth becomes acidic i.e. pH 5.5 and lower, the demineralization process begins and calcium phosphate is dissolved from the enamel making it softer and weaker. When saliva neutralizes the acid and returns the mouth to a balanced PH, remineralization takes place and calcium phosphate is returned to the teeth to return them to their former strength. If the natural balance of the mouth is disrupted, teeth can demineralize quicker than they can be repaired by the remineralization process, the enamel will get progressively weaker and thinner. Demineralization of teeth can be caused by poor diet, poor oral hygiene and low levels of saliva. When enamel wears away the teeth become sensitive and susceptible to decay. Eat a healthy balanced diet that contains minimal refined sugars. Clean all surfaces of each tooth thoroughly twice a day by toothbrushing and flossing. Clean your tongue every day with a tongue scraper. Chew on Xylitol gum to stimulate saliva flow. Avoid anything that can cause dry mouth; e.g. medications, stress and breathing through your mouth. Fluoride can be highly toxic if ingested or absorbed in high enough levels. It is possible to be exposed to fluoride from many sources including; drinking water, food, beverages and dental health products. It is possible for some people to be overexposed to fluoride without them actually knowing it. Fluoride is known to cause a staining effect on the teeth called fluorosis. Early research suggests a possible link between overexposure to fluoride and mental health disorders. There are suggestions that children who have been exposed to fluoride may exhibit lower IQ levels. Accumulation of fluoride can cause Skeletal fluorosis which is a weakening of the bones. There is some mixed evidence to suggest that although fluoride can increase bone density it can also directly contribute to an increased risk of bone fractures. People with weak kidney function are more vulnerable to over exposure because their kidneys are unable to excrete fluoride efficiently. Early research is linking fluoride to diabetes. Clinical studies on animals have shown a link between high fluoride levels and decreased fertility in males. As beneficial as fluoride may be to teeth enamel there are obviously some very real concerns regarding the detrimental effects it can cause to the human body. In terms of increasing enamel strength and resilience, there has never been a viable alternative to fluoride up until now, and that is where Theodent comes in. 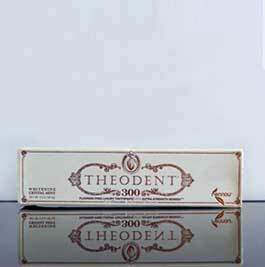 Theodent is a fluoride free toothpaste that uses an ingredient called theobromine as a therapeutic agent to strengthen teeth. Theobromine is a naturally occurring plant alkaloid that is mostly sourced from the cocoa tree (Theobroma cacao). The cocoa tree is native to the tropical regions of South America but it is now also heavily cultivated in Africa and Asia to harvest the valuable seeds (usually called cocoa beans) from inside the fruit of the tree. Cocoa beans are used to produce a wide range of products like cocoa powder, chocolate, confectionary, and flavorings. When cocoa beans are processed, the 1% theobromine contained in the beans becomes an important part of the makeup of chocolate and cocoa powder. The idea of using theobromine to strengthen teeth came about by pure accident. During the process of researching the effects of caffeine on developing teeth, it was found that exposing tooth enamel to caffeine resulted in the formation of smaller hydroxyapatite crystals. Since hydroxyapatite is the main component of enamel the reduction of crystal size resulted in a quicker rate of demineralization when the enamel was exposed to acid. The research concluded that caffeine did indeed have a negative effect on teeth, but in doing so, it was also discovered that the almost identical theobromine molecule had the exact opposite effect. Rather than causing the reduction of hydroxyapatite crystals, theobromine actually increased the size of the hydroxyapatite crystals. Research shows that caffeine decreases the size of hydroxyapatite crystals resulting in weaker tooth enamel. Theobromine causes the hydroxyapatite crystals to increase by 4x their normal size which results in a significant increase in enamel strength and density. Although caffeine and theobromine are very similar, it is the slight difference in molecular structure that is responsible for the contrasting effect on tooth enamel. Caffeine causes a reduction in hydroxyapatite crystal size which makes the teeth weaker and more prone to decay and sensitivity, whereas, theobromine bolsters the hydroxyapatite crystals making them bigger, stronger and more resistant to decay and sensitivity. Clinical trials have shown that teeth enamel that is exposed to theobromine during remineralization will produce hydroxyapatite crystals 4 times their normal size. It is the formation of these larger hydroxyapatite crystals that is the key to reducing enamel demineralization because the larger the crystal size, the slower it will dissolve. The successful research led to the theobromine extract being patented under the name Rennou.™ See Dr. Tetsuo Nakamoto talk about Theodent and theobromine here. Scratched enamel surface viewed under a microscope. The same scratched enamel surface after 30 minutes treatment with theobromine solution..
Theodent toothpaste represents the first real therapeutic innovation since the introduction of fluoride many years ago. By inducing an increase in mineral deposits and enlarging the size of the hydroxyapatite crystals, Theodent can help teeth resist both dental caries (tooth decay) caused by bacterial acids and enamel erosion caused by dietary acids. The increased mineral density, size, and strength of the remineralized hydroxyapatite crystals is key to the therapeutic value of Theodent because the larger the hydroxyapatite crystals size is, the more difficult it is for acids to dissolve them. Theodent can be considered to be a 2-in-1 dual action toothpaste that is effective at preventing tooth decay as well as preventing and treating sensitive teeth. Tooth sensitivity is an increasingly common condition that becomes noticeable with occasional or prolonged short, sharp painful sensations in the teeth. As we saw in tooth anatomy, each tooth is made up of four major parts – enamel, cementum, dentin, and pulp. The dentin layer is usually covered and protected by enamel on the crown and cementum on the root. if this protection is worn away and the dentin is exposed it is likely that some level of sensitivity will be experienced. The dentin layer has a large number of microtubes (dentinal tubules) that diverge outwards from the pulp to the surface of the dentin. If these tubules are exposed because the protective enamel has been eroded away then the sensitive pulp can be disturbed by external stimuli such as cold air, hot and cold foods and beverages, sweets and teeth whitening procedures. To see research date click here. Open dentinal tubules causing sensitive teeth viewed under a microscope. After one week treatment with Theodent, all dentinal tubules have been closed off. After one week treatment with Sensodyne 5000, only some off the tubules have been closed. After one week treatment with Colgate Regular, no tubules have been closed off. Theodent toothpaste has been proven to be exceptionally quick to relieve the painful symptoms associated with sensitive teeth. As we have seen, if Theodent is exposed to the teeth during the demineralization – remineralization cycle it acts as an enabler to create larger than normal hydroxyapatite crystals. In the case of sensitive teeth, these large crystals effectively block off the open dentin tubules and prevent the teeth nerves being disturbed. As seen above, after one week, 100% of the dentinal tubules have been covered up after using Theodent. In comparison, only about 80% of the tubules have been closed after using Sensodyne 5000. In fact, in the case of Theodent, 100% of the tubules were occluded after only 3 days. Theodent has been clinically proven to have superior therapeutic properties compared to regular fluoride-based toothpaste. Its ability to harden enamel and resist acid attack makes it the first really viable option for consumers who are used to using fluoride toothpaste. For people who suffer from sensitive teeth, Theodent also offers quick acting relief that out performs other high-end toothpaste. The big advantage of using Theodent is that it does not have any of the negative health concerns associated with fluoride. The use of fluoride in toothpaste has always been controversial but recent years has seen growing evidence that it may be linked to mental health disorders, low IQ in children, autism, bone disease, diabetes, kidney problems and hyperthyroidism. It is clear that in small concentrations, fluoride is beneficial to teeth but in many people’s opinion, the potential hazards outweigh the benefits. In recent years, many consumers are turning to fluoride free toothpaste simply because they are concerned about the potential side effects. For people who are at risk of dental decay because of dietary, poor cleaning routines or health reasons, choosing a fluoride free toothpaste may not be the best choice for the health of their teeth. Theodent offers a fluoride-free alternative that has all the therapeutic benefits without the toxicity. By contrast to fluoride, Theobromine (the proprietary active ingredient in Theodent) does not present any health risks or side effects for humans although it should be noted that products containing theobromine such as chocolate are toxic to domestic animals such as cats and dogs. Animals are slow to metabolize theobromine compared to humans so even a relatively small amount of chocolate can be fatal to a cat or dog. By comparison, a human would need to eat around 85 one ounce bars of chocolate to achieve the same result. Theobromine also has some complex characteristics that make it medically useful for widening arteries and lowering blood pressure, treating coughs and as a mild mood stimulant. What are the Theodent Products? The three toothpaste products on offer from Theodent are all very similar with regard to the ingredients used to produce them. The only difference between them is the strength of the proprietary ingredient Rennou™ and the flavorings. What is the difference between the Theodent products? Theodent 300 has the strongest concentration of Rennou™ which is estimated to give a 360% increase in enamel hardness compared to 210% in the Classic and kids versions. The only other difference is that the kid’s version is chocolate flavored compared to the mint flavorings of the Classic and 300 kinds of toothpastes. Teeth enamel is composed of about 96% calcium and phosphate hydroxyapatite crystals. These crystals can be easily dissolved if they are exposed to acid in the form of bacterial acids produced by plaque or by dietary acids from food and drink. Theodent works by actually increasing the size of the hydroxyapatite crystals to 4 times their normal size making them harder and more resistant to acid. The end result is that teeth brushed with Theodent toothpaste will be more resistant to tooth decay and sensitivity. Theodent is completely fluoride-free. However, it still has the same enamel hardening properties as a fluoride toothpaste. Theodent uses a cocoa bean extract called theobromine to reinforce and harden the teeth enamel to the point where it can resist acid attacks and erosion. Thoedent does not contain SLS (Sodium Lauryl Sulfate). Theodent uses Sodium Lauroyl Sarcosinate as a surfactant to enhance the foaming properties, aid the cleaning process and help the active ingredients come in contact with the teeth for the longest possible time. Although Sodium Lauroyl Sarcosinate sounds very similar to Sodium Lauryl Sulfate it is a more gentle chemical compound that does not have the same irritating characteristics as SLS. Click here for more information on SLS and toothpaste surfactants. Theodent does not actually contain chocolate, it contains theobromine which is a cocoa bean extract. Theobromine is also found in chocolate. The kid’s version of Theodent does contain chocolate flavoring but this is not connected with theobromine or the therapeutic effects of the toothpaste. 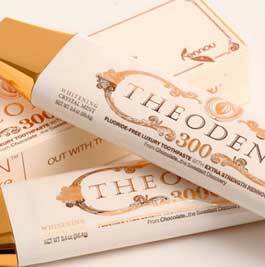 What are the ingredients of Theodent 300? Purified Water, Hydrated Silica, Sorbitol, Xylitol, Glycerin, Sodium Lauroyl Sarcosinate, Xanthan Gum, Titanium Dioxide, Citric Acid, Spearmint oil, Sodium Benzoate, Stevia Extract, Sodium Bicarbonate, Sugar Free Vanilla Extract. What are the ingredients of Theodent Classic? What are the ingredients of Theodent Kids? Very interesting article! I didn’t realise so much went into toothpaste, Ill def be looking at the ingrediants in my toothpaste from now on! Fluoride makes me really sick and I have a lot of tooth issues from my health problems! It would be amazing to try the 300 kind. Fluoride makes my joints swell up and a lot of other really not nice things. I think one of the most interesting things about the Thoedent Toothpaste is flavour, I wanna try the chocolate flavour if have chance to buy.